A successful collaboration over 15 months and three miles! 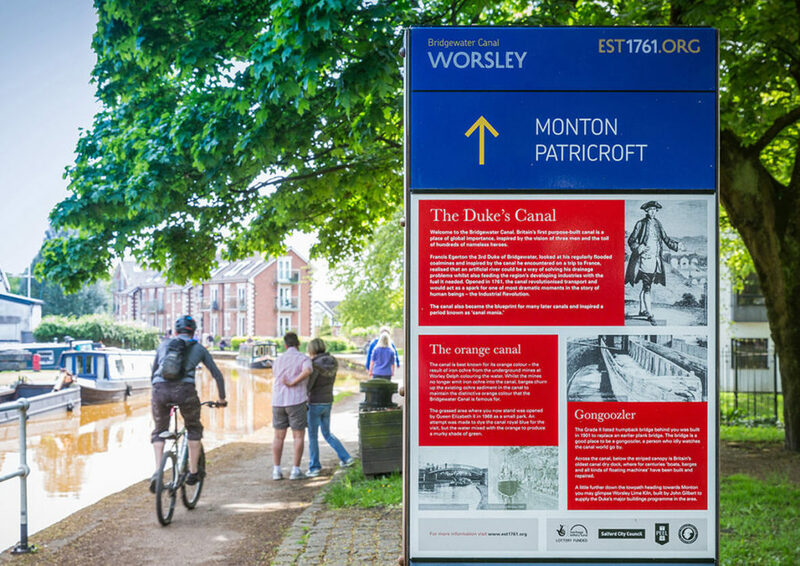 Making a three-mile length of the historic Bridgewater Canal into a more accessible and informative recreational space. 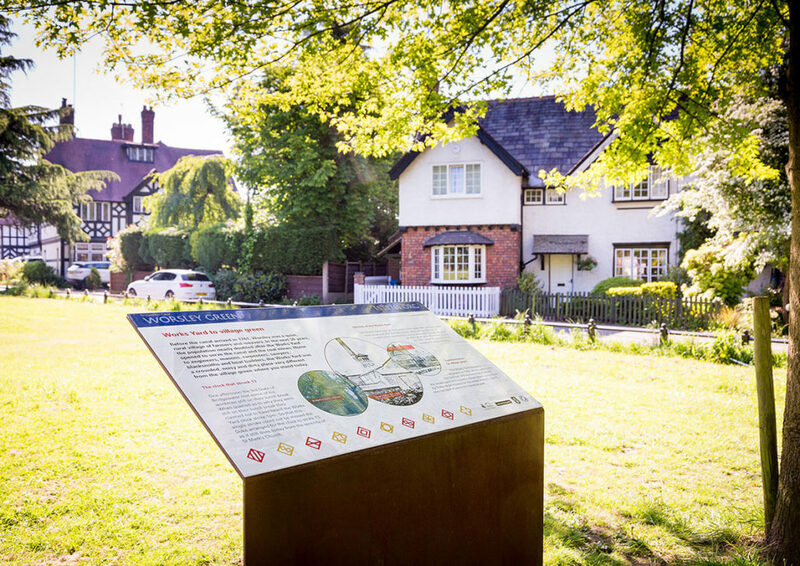 Salford City Council planned to make a three-mile length of the historic Bridgewater Canal into a more accessible and informative recreational space. 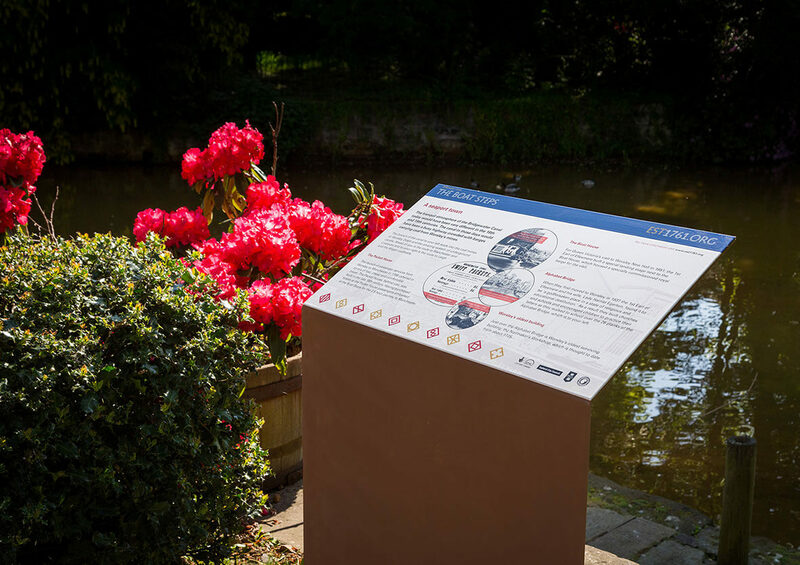 They asked a local design company to develop plans for a set of informative signs and benches so that people could enjoy walks along the revitalised towpath. With our extensive experience working with street furniture and city wayfinding, Reade Signs won a competitive tender to implement the plan to manufacture and install the features, which turned out to be the heavy lifting part of the whole project… literally! We initially looked at using glass for the wayfinding signage, but after careful research, opted for steel and vitreous enamel (VE) printed panels, incorporating corten verometal side panels for the monoliths. 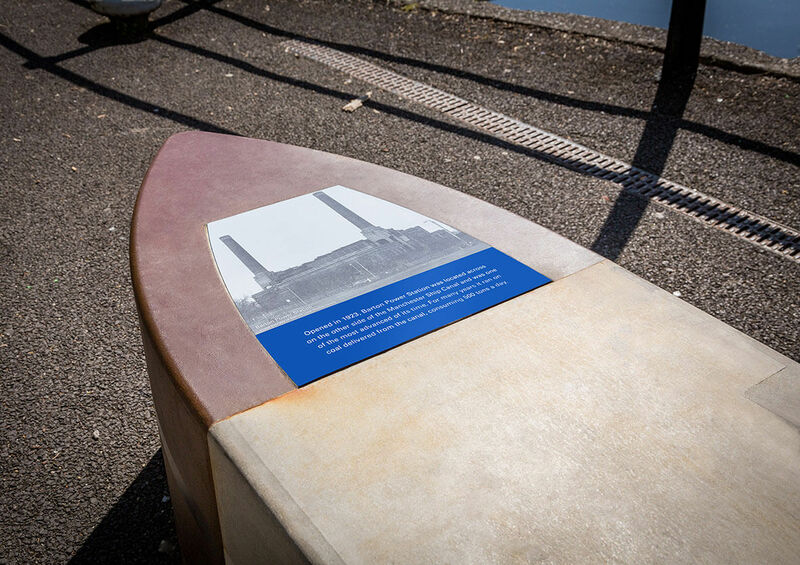 The benches – to be shaped like the traditional starvationer boats that were used to mine and transport coal along the canal – were to be made from two-tone concrete, faced with corten steel with vitreous enamel inserts. Not only are these extremely hard-wearing materials, but they would also give the structures an aged, heavy manufacturing look that would be perfect for a post-industrial setting like the Bridgewater Canal running through Salford. Vitreous enamel is perhaps best known for its use in the most iconic London underground and street signs – many dating from the Victorian period – so it’s pretty well indestructible. Corten steel has a contemporary feel, but it blends in nicely to any original ironwork in the vicinity. 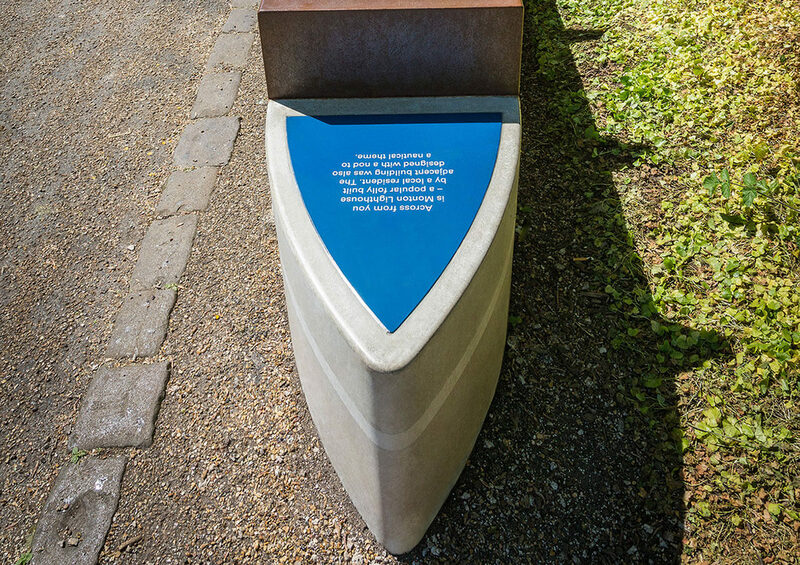 With knowledge and experience of urban wayfinding monoliths, we introduced a concrete manufacturer and supplier, Mass Concrete of Poole, to work with us to manufacture the barge-inspired seating to the design specifications. The company provided us with a variety of samples of concrete finishes, print finishes and installation positions throughout the term of the contract. From design to production, the initial concept entered a three-stage development before final approval; the production drawings were signed off after 12 months of revisions and changes. Our team took on the tricky task of project managing and planning the logistics of installation along three miles of canal in January, during what turned out to be one of the worst winters for a long time. Despite the weather, our installation team installed 13 benches, five monoliths and four lecterns in place and on time. 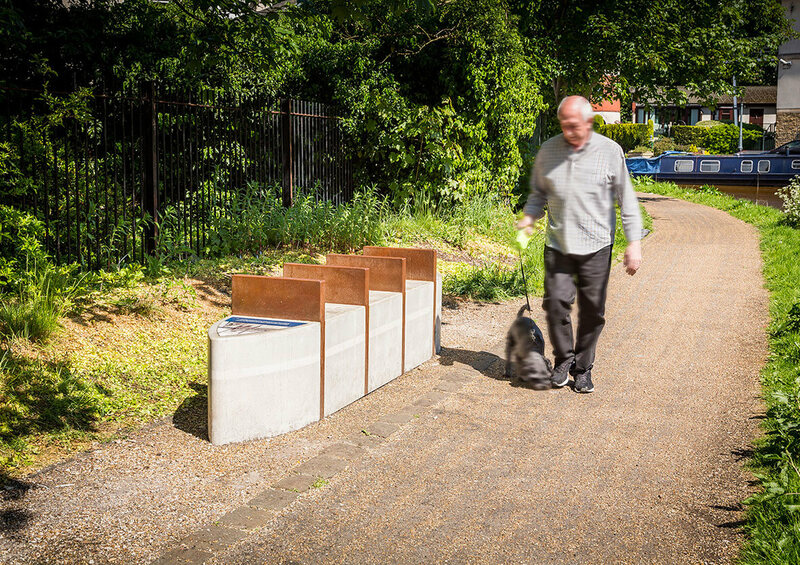 To do this, we looked at different methods of installing, but there was no way we could get a vehicle along the towpath carrying 600 kg benches, so we enlisted the help of Peel Ports and the use of one of their barges to crane everything into position. Our installation team, trained to work safely by water, was equipped with lifejackets and harnesses so they could fix everything in place. "We successfully delivered a 15-month, multi-agency operation along this historic waterway. This is one of the longest projects we’ve undertaken and over a significant geographical area, and we carefully maintained momentum and focus to meet everyone’s deadlines. The result is a living, recreational environment that informs locals of Salford’s industrial past that will last well into the future. Our clients are delighted with the work and we hope the people of Salford will be too."